Enjoy freshly baked Brun Pav, spread with a generous layer of Amul Maska. 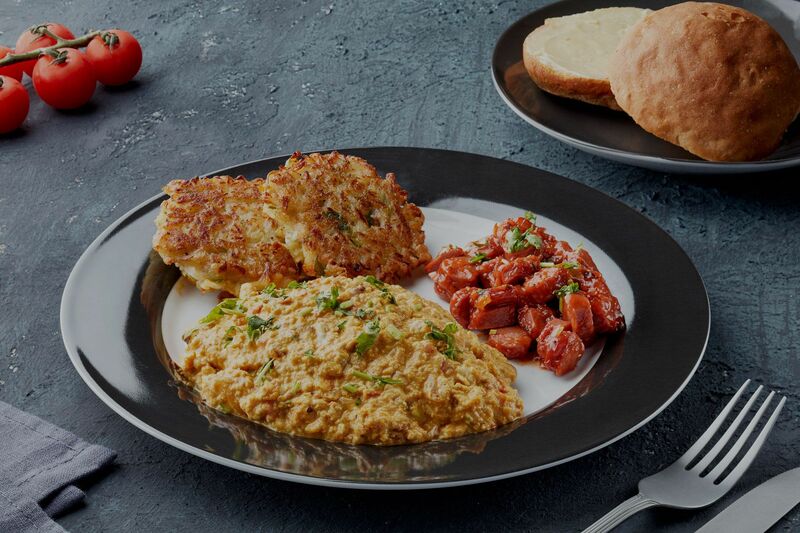 Dip it in Chai or have it any other way with our Parsi omelet, Akuri, sausages, hash browns or Kheema. We had took advantage of Friday morning and drive to Karama for Breakfast. Try some thing different this Parsi restaurant is serving its own speciality in breakfast. Basic starts with freshly baked Bun with or without Butter and milk Tea served in glass. French Toast salty /sweat creme and both were delicious. Parsi Omelet with herbs and spices were good. In last delicous pudding served. Was invited for a tasting by the owners. The couple who've started this place are extremely passionate about their heritage and their food! The decor is a bit all over the place with industrial ceilings and abstract photos on the walls but the place accomidates around 35 guests in total. They have delivery all over Dubai. They have a Tuesday deal which is a buy 1 get 1 free on mains. They also have a buffet on Fridays and Saturdays at lunch time (after 1230pm) which I'd want to try sometime. They also have the best tea I've tasted in and around Dubai! Ordered the ankuri is a plate of Parsi hash browns, sausages and eggs which is absolutely yum! Also got an authentic parsi dessert called the Parsi Lagan nu Custard which was very different from anything I've tasted. No complaints about food and service; very reasonable and filling. Its a must check out restaurant in my opinion. Located at the foodie paradise along Karama, Kebab Bistro is owned by a Parsi couple and offers food that is prepared with authentic Parsi recipes. It has been operating for a long time in Dubai now and has emerged as one the few places that offer authentic Parsi cuisine as opposed to those which merely claim to be Parsi. The set-up is nothing too fancy, but still gives positive vibes. The walls inside the restaurant are adorned with photos of some of the most famous Parsi personalities as well as a few glimpses of this community in India. We ordered the Kheema par edu, which was tangy minced mutton topped with eggs. This dish was totally scrumptous. It actually appeared to be very similar to what the overpriced shakshuka tastes in other places. Then, from starters we had the famous Patra ni Macchi, which was a fillet of fish marinated in green chutney and steam cooked in banana leaf. An excellent Parsi specialty indeed and very much recommended. Besides this, we also tries the flat fried Mutton Cutlets and the Chicken Cream Tikka. Both very different in flavor but absolutely appeasing to the taste-buds. The Bistro Mix Grill platter was superb too, the portions were great for the price and we got to try a flavorful assortment of kebabs and botis. For the main course, our orders were the Chicken dum Biryani that came properly layered and aromatic with the infusion of perfect spices, and the Dhansak which was an utterly delicious thick stew prepared with lentils and meat. In addition, the Khichri Kemu served as a good combination of mutton and basmati rice. For dessert we tried the Parsi Lagan nu Custard which is a “must-have” sweet dish at Parsi weddings, so you can image how flavorful it must be! Our dining experience here was totally worth it. The ambiance and service was perfect. It’s a meat lovers’ heaven down here, although they do offer good vegetarian delicacies too. The A’la Carte menu flaunts many Parsi classics for breakfast, lunch as well as dinner. The eatery also offers a lavish buffet on weekends. It’s a place where you’d want to keep going back for more. Basically, it’s finger licking good food that can be enjoyed even by budget conscious people.